The end of summer doesn't have to mean the end of wearing skirts. In fact, there are many styles of skirts that are appropriate for the cool, crisp months of autumn. From slim-fitting pencil skirts to trendy midi skirts to ankle-skimming maxi skirts, you'll find dozens of options at JCPenney for updating your fall wardrobe with this basic style staple. Slim, straight skirts look great when paired with tunic-style tops and flowy blouses, while bright, bold patterns are sure to draw maximum attention. Sheer styles with a short underskirt can be easily layered over a pair of opaque tights to create a look that's appropriate for day, night, work or play. Want to break from the traditional? White skirts look just as great in fall as they do in high summer, especially when paired with suede ankle booties. Not ready to pack away the short skirts just yet? Slip on a pair of over-the-knee boots for an effortlessly cozy fall style. Pencil skirts are chic, sophisticated and polished, making them the ideal office attire. These skirts feature a slightly tapered cut that grazes the knees and a slim-fitting design that makes every silhouette appear sleeker. Pair them with a crisp, button-down shirt for a work-appropriate look. Top the outfit off with a belted cardigan for a style that transitions easily from the boardroom to happy hour. 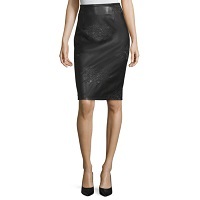 Black pencil skirts subtly slim your profile, while printed pencil skirts instantly give the illusion of curves. Brightly colored pencil skirts are also available and offer a great way to show off your bold personality and sense of style. Feeling flirty? The Worthington Pencil Skirt features a bottom panel that flares out slightly at the knee for a look that's undeniably feminine. Stay on-trend this fall with a mid-length midi skirt. This skirt length subtly lengthens the leg, making it ideal for shorter women. Midi skirts are available in a range of styles and cuts that flatter every figure. Choose from a-line skirts, tulle skirts, plaid skirts, pleated skirts and many more. Coordinate your midi with a solid colored button-down shirt for the office, or add a fitted jacket and sneakers for a casual weekend look. With so many different types of midi skirts available, the possibilities are endless. Ankle-length maxi skirts are the ideal choice for fall. These long skirts are flattering on every body type; these skirts can be worn with everything from sweaters to tee shirts to cardigans. Chiffon-style maxi skirts are billowy and romantic while remaining simple enough to be worn during the day. Pleats add texture without volume, so you can be sure you'll always feel as great as you look. Plus size skirts with comfy elastic waists ensure you won't have to sacrifice style for comfort, while interesting details like back slits, side shirring and pockets add to the versatility of this classic style of skirt. JCPenney carries a wide selection of women's skirts to suit every body, taste, and budget. Shop our collection of fun, flattering and stylish skirts today.